ARC Auto Rod Controls #3101 Switch Panel, Steel, Black, 5.25 in. Wide, 2.5 in. Tall, Nitrous Panel, 3 Rocker Switches, 20 Amp, Dash Mount, Each. A07-3101 Description:These ARC switch panels are used by top professional teams because of their reliability and ease of use. 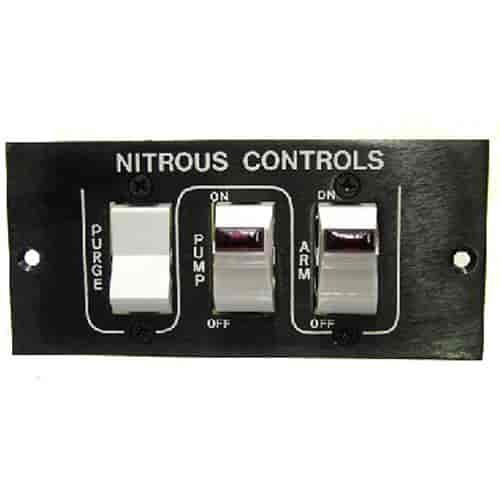 This nitrous panel includes a momentary purge, a pump, and an arm switch. With independently-fused circuits and no exposed connections, ARC Pro Stock Control Modules provide the most complete electrical control in the smallest space. Their 20-amp, DC-rated switches and 30-amp fuse holders combined with their wiring and mounting ease make them the dominant choice of racers. The 3100 mounts in-dash, and the 3700 series mount overhead. Additionally, the overhead module for nitrous systems includes Purge, Pump, and Arm switches.